Good morning! Only one more day until I'm back. My flight comes in really late tomorrow night, so my first stamping day will be Friday! Sooo excited to get back into the groove! I have some serious catching up to do. I missed last week's Viva la Verve and the new VLV is posted this Friday- my first day back. 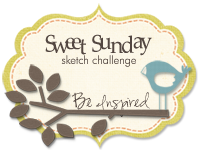 I've also missed Karen's Sweet Sunday Sketch. I'll be home too late to submit it, but I think I'll still give the sketch a try. 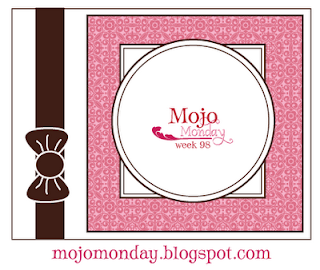 Mojo Monday also came around once again, but I have a few more days to finish that one up. I love, love, love this sketch! I know, I'm not usually a giant circle fan, but I like this one! This is definitely one of those sketches that I'll keep around and use again. Thanks for stopping by today! I'll see you on Friday! Love the dp and your gorgeous ribbon! have a safe trip back! It's been crazy busy with the Verve release week...ugh! I'm exhausted!! This is beautiful... just perfect (as always)! :) Love the colors and that Martha punch is awesome!